To produce 30t/18h coating board paper, Leizhan engineer develops the following solution. The whole project contains two parts: pulping system and paper production system. First, waste paper is conveyed to ZDSD23 D typer hydrapulper for pulping. Second,the paper pulp will be conveyed into automatic deslagging device ZSC4 high density cleaner to remove heavy impurities like staples, stones, glasses, etc. in the paper pulp. Third, the paper pulp entered into ZNS0.3 mid consistency coarse screen for coarse screening of the impurities in the paper pulp. Lastly, the paper pulp will be conveyed into NLS0.6 headbox for paper making. 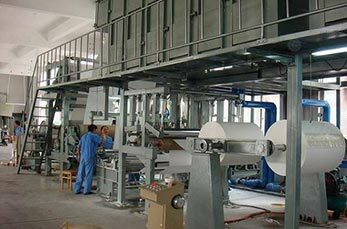 Leizhan 30t/18h coating board paper production project can produce 30t end products per day. It has a net width of 2400mm and a basis weight of 80-250g/m2. The working speed of this system is 100m/min.